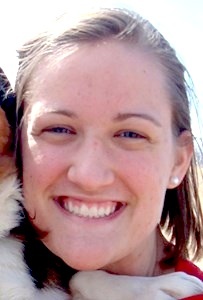 Megan (Greving) Henn, 24, of Olathe, passed away on May 11, 2016. She was born on March 14, 1992 to David and Margaret (Brennan) Greving in Sioux City, Iowa. She attended and graduated from Prince of Peace grade school and Saint Thomas Aquinas High School (’10). She received her B.S.N. from Truman State University (’14). Megan was employed as a nurse by Olathe Medical Center. On October 25, 2014, she married Robert “Tyler” Henn, and they made their home in Olathe, Kansas. Megan had a kind spirit and was a caring friend to many. She was a warm, empathetic nurse to her patients. She loved dogs, volunteering for many years at Wayside Waifs and adopting two dogs, Roxie and Twix. Megan was an avid swimmer during her school years. Her enthusiasm and smile could light up a room. Megan is survived by her loving husband, Tyler, her parents Dave and Margie Greving, Tyler’s parents Bob and Terry Henn, her sisters Katie and Theresa Greving, her grandmother Jean Brennan, and many loving aunts, uncles and cousins. A devoted wife, daughter, sister, and friend, she will be immensely missed by all those who love her. She was preceded in death by her grandparents Tony and Loretta Greving and Richard Brennan. A memorial mass will be held at 1:00pm on Monday, May 16, 2016 at Prince of Peace Catholic Church, 16000 W 143rd, Olathe, KS with visitation from 11:30am to 1:00pm at the church.